Recently, I tried to integrate AWeber Communications with your service. While following the steps in your AWeber Integration Wizard, I received the following error (screenshot attached). While matching the form fields, your service is telling me that I need to add a Full Name Field to my form. I checked with AWeber and they verified with me that, indeed, my form has a full name field saved. The error message pertains to the type of the field on your JotForm form. Please try using a Full Name field, as found under the Quick Tools on the left of our form builder. You seem to be using an Email field instead at the moment, which is only named as "Name". The Full Name field can be integrated to third parties, they were designed as such. The Full Name field can integrate to fields for names, Email field integrates with emails, Address field can forward an address, and so on. 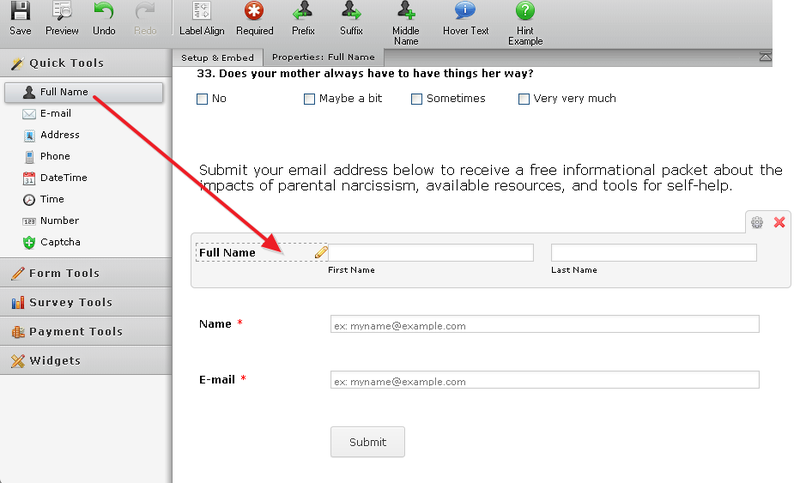 Please let us know if using an actual Full Name field from under Quick Tools is able to resolve the problem. Thank you.